If you’ve spent any amount of time in manufacturing, you know that efficiency matters. While saving a couple of seconds in cycle time can significantly increase efficiency in a high production manufacturing environment where thousands of parts are produced for one job, minimizing setup time is the key to increasing efficiency in job shops that manufacture small numbers of parts for multiple jobs each day. Mike’s enthusiasm for 5-axis machining and Hurco’s commitment to 5-axis merged 10 years ago. Hurco wanted to focus research and development (engineering resources) on technologies that would make the company’s core customer (job shops) more successful. Due to Mike’s real world experience as a shop owner, machinist, and applications engineer, his input to the features we develop and ability to explain the benefits to machinists are indispensable. In addition to helping Hurco customers and distributor sales people in the field, Mike has shared his 5-axis expertise at numerous manufacturing events around the world. In fact, the impetus for this book was yet another event where he agreed to speak about 5-axis technology. Reviewing past presentations and doing some research online to make sure his information was up to date, he realized there weren’t any books that provided a comprehensive view of 5-axis from the standpoint of a machinist. There are books aimed at engineers or books that discuss tool paths and CAD/CAM systems, but they were either highly technical or a bit outdated. Additionally, we noticed his post “5-axis…it just ain’t that scary” on the CNC Machinist Blog (blog.hurco.com) was the most popular. While this book was backed by Hurco, our company supported Mike and the team in writing a book that would be relevant and helpful to all machinists. 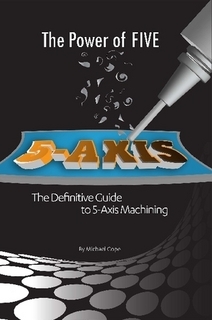 Our hope is that this book will give you useful information no matter your experience level and you’ll see there is no reason to fear 5-axis…it just ain’t that scary!